Steal All Sorts of Cool Stuff with Your Literal Cat Burglars. The Cats are Coming Back! Hurry! Get out your hammer and start nailing everything you own to the ground, because the KleptoCats are back in town. There's more of them now than ever before, as well as more objects for them to steal, more secrets to discover, and more wacky hijinks to share with your friends. Break out the cat food and stock up on the catnip, for this is going to be a wild ride. Cat burglary might be bad news for the population at large, but it's great news for you. Your loyal feline companions are ready and willing to share the bounties of their hunts with you, just as long you keep up your end of the deal. Collect over a dozen thieving but absolutely adorable cats. Decorate your house with all your pets' stolen booty. Take care of your kitties. Pet them, wash them, feed them, and clean up after them. Play minigames to earn more coins. Discover hidden secrets throughout your home. The fun never ends wherever cats get involved. With all the cats you'll get in KleptoCats 2, you can imagine just how much fun you'll have every time you pick up your phone. Download the app now and begin your career in cat burglary today! Besides tribalistic dog-lovers and people with allergies, who doesn't love cats? Nobody, that's who! That's what the people over at Hyperbeard were thinking back when they made the first KleptoCats app, because that's pretty much what it was all about. That's also what the sequel is all about: cats and how utterly cute they are. 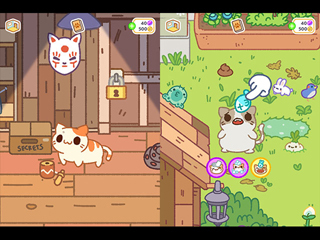 KleptoCats 2 is certainly not without its charm, but it also proves that charm can only get you so far. 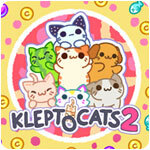 What do you do in KleptoCats 2? That's actually a difficult question to answer, in large part because it doesn't feel like you do anything most of the time. You begin locked up in some shack you've never been to before with only a cat to keep you company. A portal appears, the cat jumps through it, and comes back a few seconds later with something that looks vaguely like a clock radio. Having no visible use for the thing, you simply stash it on a nearby shelf, and send the cat out to fetch something that will hopefully help you get out of this dilapidated little building. It does so, returning with another item that appears to be a mask of sorts. That doesn't seem so useful either, so you send the kitty out on another excursion. Do you use the things your cat collects to get out of the room in an unconventional way, like in an adventure or escape game? No, you just keep tapping the cat until it finally gets you the key, in which case the door unlocks automatically and you proceed on to the next room. There's no puzzle-solving to be had here; you just tap the cat and it brings some doodad or other to decorate the house with. That's pretty much KleptoCats 2 in a nutshell. The general lack of interaction to be had or challenge to be beaten make this app feel very shallow and boring, but the fact that you have to wait for a cat to get something for you just adds insult to injury. The first few instances you send your cat out literally last a couple of seconds, but after that, they quickly ramp up to well over five minutes, and give you the option to speed things along with a payment of coins. This seems to imply that there's some kind of value to what your cats bring home, but there isn't. KleptoCats 2 is literally just a waiting game. Okay, maybe that's being overly hyperbolic. The app has at least a little bit of interaction. Sometimes, the cats get dirty, unhappy or hungry. When that happens, they won't be so willing to steal stuff for you, so you have to clean, pet or feed them until they're satisfied again. They also crap all over the place instead of using the litter box like a normal cat would, so you have to periodically clean up the stools, which net you some coins. That's pretty much the extent to what you can do with your cats and your virtual home, and it's every bit as exciting as it sounds. If you're really hurting for coins, you always have the option to play some minigames, which can also help kill time while you wait for the cats to return. Unfortunately, these minigames are too utterly simplistic and mind-numbing to have any lasting value. Chances are you'll get bored of them in a matter of minutes, if not seconds. When something that looks and plays like a dumbed-down version of Snake with no failure states represents the pinnacle of interactivity the app has to offer, you know you're in for a slow time. With the general lack of effort put in or expected of you, it's questionable who exactly this app is meant for. The constant waiting for something to happen make it a poor game to kill time with during a coffee break or train ride. Really young children might get a kick out of the visuals, which are admittedly very cute and whimsical, but the amount of text they'd have to read through might very well turn them off, as would a lot of the jokes that would fly over their heads. Players who like to wrack their brains to solve a mystery might like to uncover the occasional secrets the app likes to shuffle away out of sight, but those are too few and far between to be considered substantial. 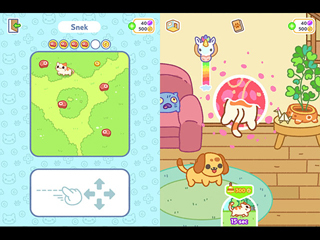 In the end, all that can be said about KleptoCats 2 is that it's likely made for people who just like cats and cute things in whatever form they take. If that's the case, they'll likely be satisfied fooling around on this app. Then again, the internet isn't short on LOLcat memes and videos, which are far more entertaining than KleptoCats could ever hope to be.